Get two different takes on the Dark Knight with these two new shirt designs. 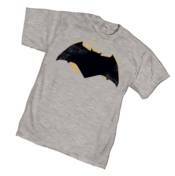 Batman: Hush II features the art of Jim Lee screenprinted in color on a black shirt while Batman Movie Symbol gives you the basic bat logo on a light steel shirt. NOW AVAILABLE for sale in Canada and U.K.